The Orphan Boy – Page 2 – "Once, a worrier. Now, a Warrior." A military nurse invites a young man for a walk – just an innocent beginning. The nurse is absent without leave in the Army. . and the young man is about to get married. Gerry and Arjel haven’t seen each other for years… but their relationship goes back like brothers, in flesh and blood. This walk, perhaps, could be just a start of an even longer journey. They lived in two different worlds. Arjel was 16 then, when he met Gerry, 20 that time. Arjel used to live in their town province, used to love the fresh air; used to care for their poultries; used to live a simple life. While Gerry, a registered nurse, was living miles above and apart Arjel’s world. He works in the most prestigious hospital, just lying at the center of the city. Arjel was strolling back home with his cousin and the road was extremely dark and wet. His phone kept ringing, but he kept on ignoring it. Answering a call amidst this rainy night was not that important to him. Hey had to get home. The rain poured harder and harder and when they reached home, they were literally soaked in rainwater. 8 missed calls. Unregistered number. Arjel was wearing his pajama shirts and was about to sleep when he noticed his phone. The phone rang again. The unknown caller was calling. He knew he had to kill his curiosity. “Hey Arjel! It’s me.” Said a baritone voice. It’s a man. Arjel felt his smile. “Oh, yeah? Hi! Uhm, how are you? Hearing that words from a man he barely knew, Arjel’s jaws dropped. And that was the beginning of a brotherly affection. Or so he thought. Every morning when he woke up, he would receive a text from him. “Have a great day bunso.” Gerry used to call him bunso, since he was that young for him. Arjel found himself smiling every time. Maybe nurses are really sweet people. And even before lunch, after dinner, before they went to sleep, Gerry would call him. Asking how his day was, what he did, or anything about his health, his family and his lovelife. Gerry was really a big kuya for Arjel. He was so thoughtful, caring, loving like a real father and brother to him. The idea was so overwhelming for him because he had never had a real brother, and he didn’t grow up with his father. But Gerry was there. Always have. Always will. It’s like he had known this person forever. He was so comfortable opening his problems to him, even if that meant staying until dawn. One time he remembered, his kuya was courting a girl… at the same time he was courting – well, about to court a girl in school. His kuya was always there to give him all the tips and style to get his girl. Gerry had always been mindful of his carelessness in eating – because his “nurse” was always worried about how he could ever live healthy even when he’s not by his side. It’s completely amazing that the distance between them was never a wall to show their care for each other… like brothers. Time passed by and Arjel was in college. Still, his big brother never failed to assure him that, even if he’s not sure where he’s heading in life, it would help to know he’s not going there alone. “Hi kuya… guess what?” he said, his lips sideward. And just so he knew, he was about to lose one important part of his life. Gerry rarely called him, these past few weeks after he had his new girlfriend. He felt so sad for himself, because he was so used to it. The way his kuya treated him was totally different. He felt he was really loved… like a real brother. He understood the fact that he was a nurse… oh yes; he had so many souls to compete with, to win his attention. But then and again, if he could balance his time before, why wouldn’t it be the same now? He missed the phone calls before they sleep; those little sermons – or, prescriptions – about his wayward eating habits and those simple greetings in the morning. Was he that so busy? Arjel didn’t know. He was clueless. Maybe, it’s true that some good things must come to an end. 5 years passed by and Gerry was standing in front of that door… where Arjel was staying. He learned that his “bunso” was now in the city, and was engaged to be married. He knocked, and a young man sprang out. He must be Arjel. Gerry hugged him tight… tighter. Like he never wanted to let go. Feeling awkward, Arjel pushed him a little. “How is my big kuya who got away?” He asked with a grin. “O-f-f c-c-ourse… we’re brothers, a-aren’t w-we?” Arjel tried to smile. Thought the moment felt so awkward. They were taking the walk now, in that long stretch of road where there were the only trees with its weary leaves starting to fall off because of the wind. So they strode silently, their arms slightly getting closer and closer, creating electricity, they both couldn’t explain. Arjel felt like they’d been walking forever… yet, he felt so safe with this man. “Just remember how much I love you.” Gerry told him. Arjel looked him in the eye. It was a glorious moment… so they had to cherish it. For after this they’d be living separate lives. Arjel was teary-eyed. Never in their past years of communication had he had the slightest idea that Gerry was deeply in love with him. All he knew it was a brotherly love. No more. No less. He couldn’t find the words to say. He was just looking a Gerry’s face… his eyes covered with tears… his lips curving a smile… Oh, he wouldn’t forget this face. Never. They ended in a park where everything was just peaceful. They could hear the chirping of the birds and how the sky was so gloomy because of its dark gray hue. An arc of bridge was just behind them, to witness a love story… that would never be fulfilled. “I think this is it.” Gerry wiped his tears. “Y-y-yeahh…” Arjel was tongue-tied. The moment was so painful. And for the last time he hugged him… and lifted up to kiss Gerry in the forehead. Gerry smiled… then walked away. Arjel knew if he stopped and called him, his kuya would stay. For keeps. But no, he did not. 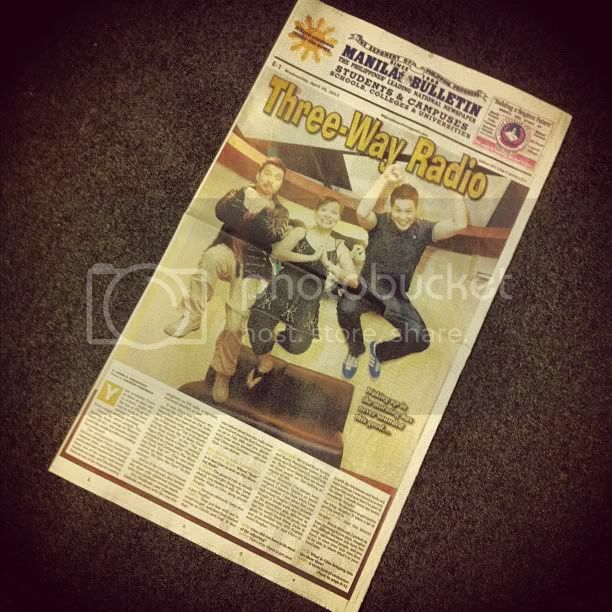 Wow, so excited to see the HUGE article that came out today in Manila Bulletin! Thanks to writer Jaser Marasigan for the insightful article and photographer Andrew Pamorada for the awesome shots (especially that jumpshot)! It’s two full pages and a one-page article on Radio 1 at the back. That was really fun! You can read the article online HERE. But you’d only see the photos in the actual newspaper, so you should check it out!